No more rushing back to your desk to answer calls. The Plantronics APV-63 Electronic Hook Switch (EHS) module enables wireless headset users to place or receive calls without the need to lift the handset of your Avaya 1408, 1416, 1608, 1616, 2410, 4630, 5410, 6416D+M, 6424D+M, 9404, 9406, 9504, 9508, 9808, 9611, 9620, 9620L, 9621, 9630, 9640, 9641G, 9650 and 9670 phones. 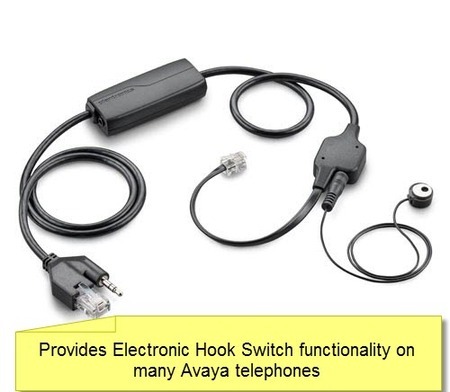 For other Avaya phones use the APV-66 cable. The Plantronics APV-63 EHS only works with the following Plantronics wireless headsets: CS510, CS520, CS530, CS540, all Savi 700 series, Savi WO300 & Savi WO350. Use the APV-6A for earlier model headsets. This product supercedes the APV-62 Electronic Hook Switch.